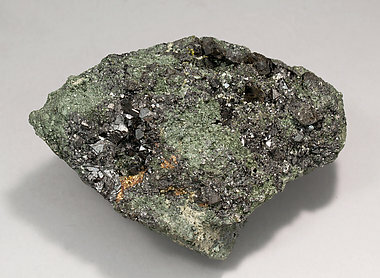 A single Allanite crystal with small Magnetite crystals, all on a matrix of Hedenbergite. The upper tip of the crystal was broken and has then recrystallized. Allanite crystals with very well defined faces and edges, one of them clearly dominant and of a considerable size for such samples. 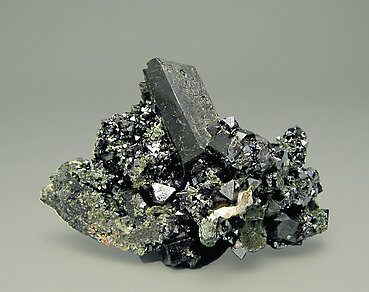 The Allanite crystals are partially coated by small acicular Epidote crystals and are with very sharp octahedral crystals of Magnetite. 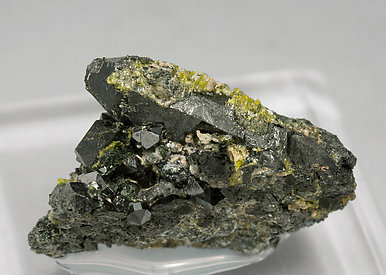 Allanite crystals with very well defined faces and edges, on a matrix of the same Allanite and with very sharp octahedral crystals of Magnetite. A clear and well-developed prismatic crystal of Allanite on matrix with very sharp edges and faces. 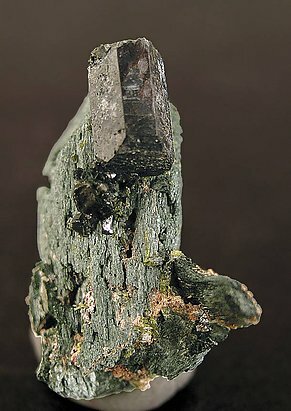 Magnetite octahedrons and small pistachio green Epidote accompany it.